Ultra modern and exceptionally detailed, this is culinary fashion at its finest! This black "Lite" fabric twill coat partners a cross-over collar with crisp clean lines to create a sleek and slimming appearance. The white ribbon detailing the edge of the double breasted front and the inset thermometer pocket is definitely a bold contrast, yet a surprisingly elegant touch. The notorious Chef Works circular "Fork" logo sits proudly on the left sleeve above the ribbon accent. While the Verona is the same expertly tailored women's cut that you've come to expect from Chef Works, the clever features they've added will surely exceed your expectations. 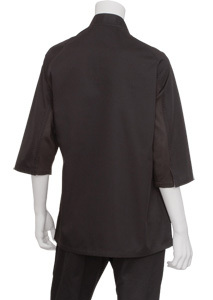 Cool Vent panels of black breathable fabric line the under-arms and sleeve. The side slits, that finish the hips and base of the 3/4 length sleeves, ensure that the fabric will never be tight or restricting movement as you bend and move about a busy kitchen. Constructed of a light weight 4.06 oz poly/cotton is practical for both ease of maintenance and a cooler garment. Make it your own! 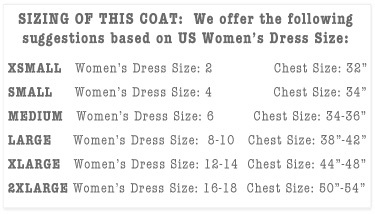 Personalize this coat with embroidery on the right chest, simply click the checkbox next to Embroidery $5 per Line. Please allow 3-5 business days for customization. 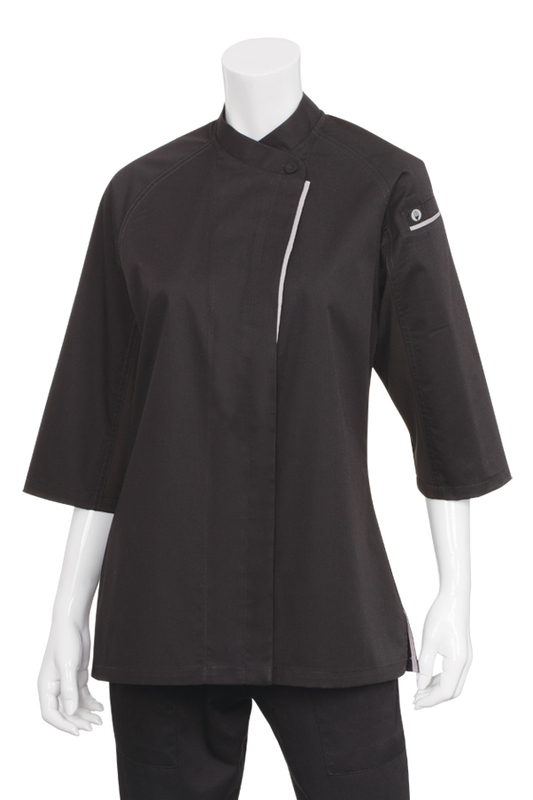 On the Black V-Series VERONA Women's Chef Coat, Aimee says: "�the jacket fit perfectly - it wasn't too snug and was honestly just what you would need in the kitchen. The sleeve length was perfect for when it gets hot and you are flying through the courses behind the scenes, but being 3/4 length means you won't have to stress over rolling the sleeves up or cooking and then down to look presentable and calm outside of the kitchen. � Be it a small or large occasion, on the beach or in a home, I know this jacket will be a great fit for both my image, and my job at hand. The type of events I cater range from small corporate events to large scale weddings and meetings. And of course, no matter what the event is, when I'm behind the scenes rocking away with my team, I'll be wearing my new jacket so to stay fresh, crisp, and simple." ABOUT OUR FEATURED FOOD BLOGGER: (BargainBites00.com) If you've got an appetite for gourmet cuisine but prefer to "dish out" a home diner style price, WELCOME to Bargain Bites Recipe Blog. It's a haven for budget savvy home cooks that want sumptuous flavor without having to stock their pantry with hard to find specialty foods and pricey exotic ingredients. Aimee Kleer-Gonzalez, food blogger, private caterer, proud new mother and author of Bargain Bites, has written and compiled a vast collection of recipes, fit for everyday fare, that will delight your taste-buds and fire up your passion for cooking. Gone (thankfully!) are the days when you thumbed through a gourmet cookbook, looking only at a recipe's beautifully presented final product, you know those decadently displayed, photo perfect dishes and all the while you're wishing the chef could pop-out of the book and walk you, step by step, through the whole process. Thanks to the tireless efforts of this passionate chef, and her stunning Bargain Bites cooking blog, we get the gorgeous, mouth watering recipe photos, PLUS every brilliantly displayed step along the way. It's a personal cooking tutorial - at your own pace, every step is photo documented with helpful instructions. Aimee has also included helpful tips and some "heads-up" pointers of problem spots you may want to avoid. For your convenience, Bargain Bites is indexed with easy to navigate categories like Seafood, Pasta, Grilled, 5 Minutes, Vegan/Vegetarian and Desserts. Some recipes are further tagged with Gluten Free, Dairy Free, Low Cal or Low Carb to help you find the meal that fits your tastes and dietary requirements. Take for example her recipe for Spinach and Sundried Tomato Stuffed Pork Loin, Spiced Lamb Burgers or Caramelized Onion Tarts with Crumbled Bacon, these recipes may sound daunting but are entirely do-able with Aimee's expertly presented instructional blog posts. Is there anything better than the warm welcome home aroma of freshly baked bread? The scents from the kitchen beckoning all to come, sit, and partake in the timeless act of breaking bread. Luckily this notion is easily within reach (without a bread machine!) thanks to this beautiful recipe for Cheddar Artichoke Bread. You can see the soft buttery richness of the dough, accented with golden cheddar and savory artichoke leaves, this is an absolute Must Bake! If Fresh Broccoli isn't yet on your list of things you CRAVE, then you obviously have not yet tried the Healthy Broccoli Salad. This salad is packed with flavor and entirely guilt free. The zesty greek yogurt dressing has found its perfect flavor counter part - sweet plump raisins. Combine that with the crisp shreds of carrot and vibrant broccoli crowns and you've got a recipe that will headline the family picnic. In the mood for a little dessert? Bargain Bites helps you bake brilliant Italian Pizzelles, - the kind you usually get at your favorite espresso bar. Again, step by step instructions will help you make it perfectly the first time. And you simply must bite into these absolutely addictive Super Soft Peanut Butter Blossom Cookies. And Aimee's personal recommendations: the Bacon Wrapped Hickory Smoked Meatloaf and the Summer Fruit Tart. Thanks Bargain Bites for helping us unleash our own inner gourmet. 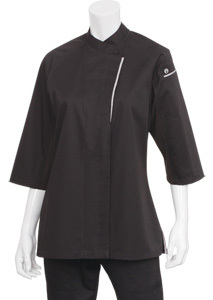 On the Black V-Series VERONA Women's Chef Coat, Lindsey says: "I like to consider my �catering� gigs informal: wedding showers, events under 50 guests, dinner parties. Yet in true American female fashion, I am always concerned about what to wear when I�m cooking for others in public. I want to look nice, yet it is guaranteed I will get food on myself. For me, this coat is practical and professional. I would recommend it to any caterer, restaurant cook, or�like myself�the enthusiastic entertainer looking to leave the party without olive oil on her blouse. 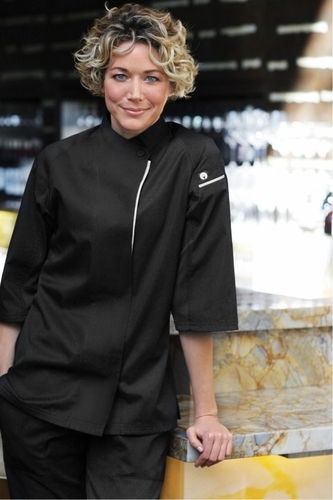 I am planning to don this fashionable coat for upcoming cooking demos, so I have been wearing it regularly in my own kitchen in lieu of my usual array of aprons." A Pear To Remember, a food and lifestyle blog authored by the George Mason University's Nutrition and Food Studies' graduate, Lindsey. Her pages greet you with a bushel of vibrant red radishes, brandishing their multidirectional roots. It's definitely a foreshadowing into the lively and refreshingly zesty musings of this blogger. Explore the culinary world with Lindsey through health conscious and practical recipes, engaging stories, witty anecdotes and beautiful photography as she unearths the roots that stemmed her own passion for culinary journalism. Lindsey's sound knowledge of nutrition is evident in the recipes and cooking tips she offers. Her food flourishes with items from the Fresh Produce isle (check out the Watermelon Bites), the Dairy Cases (these Blue Cheese Crackers are a must try) and the bulk Whole Grain barrels that can sometimes bewilder novice Trader Joe's or Fresh Market shoppers (Quinoa and Bulgur Salad with Feta beautifully accented with lemon and mint). Other shining example posts on A Pear to Remember are Zucchini in the Holy City and Asparagus Ravioli with Brown Butter Sauce. Thanks Lindsey, for the devoted research and discovery coupled with inspiring words and photography that bring these recipes to life and urge us to conquer our own kitchens.